SUBHEAD: Societies that were healthy, educated, happy that had little waste, government or need for energy. 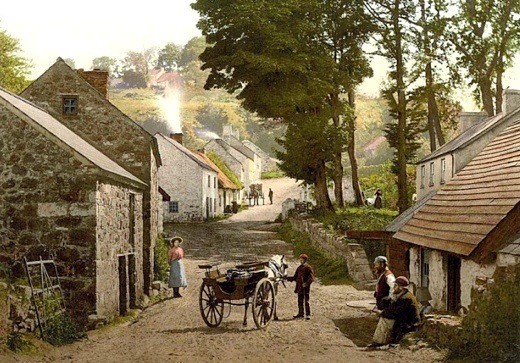 Image above: Retouched photo of the village of Glenoe in County Antrim, Ireland in the 19th century. From (http://www.newsletter.co.uk/lifestyle/nostalgia/picture-special-nineteenth-century-ireland-has-been-revealed-in-a-series-of-photochrom-postcards-1-7914650). If we want to learn from people in more traditional eras, we can do several things; we can read books and journals from that era, from before fossil fuels or electricity, before cars or internet, before everything became cheap and fast and thrown away. Some books from that era remain widely read; Mark Twain and Laura Ingalls Wilder from the USA, Jane Austen or Charles Dickens from England, and I would encourage readers to can go back farther in history to medieval writers or Ancient Greeks and Romans. We can also read historians who specialise in everyday life, or people today who still practice traditional crafts and write about it – I recommend John Seymour and Scott Savage, among others. Many people today are forced by poverty to live simpler lives, as in the Third World, but their circumstances are often less healthy, literate or safe than those of 20th century Ireland. We in the West have too few first-person narratives from people who grew up in such poverty, and their cultures, climates and languages often pose a barrier to understanding. We can talk to people closer to home who grew up with very little – say, people who grew up in trailer parks or slums – but again, they experienced a different kind of poverty. Most families I know in my native USA grew up with a lot of television, little freedom and the constant threat of violence; in many ways, they experienced the opposite of my Irish neighbours. We can talk to people Western countries today who grew up living more simply than most Americans today – say, Amish, Mennonites or plain Quakers. Such groups, however, typically withdrew from the world because they have a rigid and insular culture, making them reluctant to share with outsiders and making their habits less relatable. I wasn’t just interested in sitting and watching television shows about people living simpler and more traditional lives; I wanted to learn how to do so myself. We can talk to elderly Americans who remember the mid-20th century, and I have talked to quite a few over the years and learned a great deal. Their world, however, is not too unfamiliar; if you talk to a 70-year-old American, you are still talking to someone who grew up watching television and sitting in traffic. That’s what makes my Irish neighbours so valuable; they are among the last Westerners on Earth, speaking English and now living in a familiar modern world -- to grow up in the pre-modern world, before electricity and modern media, before cars and modern devices. As late as the 1960s in Ireland, by contrast, fewer than one per cent of Irish owned a car, relying instead on feet and horses. As late as the 1970s many areas lacked electricity, meaning not just electric lights but radio and television. Their lack of modern influences kept the culture parochial and traditional even into modern times; birth control was legalised only in 1978, and divorce only in 1995. My elderly neighbours grew up with different priorities from people today; they had skills, not career tracks, and lived not as individuals but as members of something greater. Their homes were filled with family members who pitched in with the work of getting food and water and warmth, and the ones who worked outside the home brought in the little money they needed for a few luxuries. At gatherings they sang songs and told stories that were hundreds of years old, passed down like prayers from father to son, mother to daughter. They grew up knowing the histories of their cousins and neighbours, who were often the same people. When I ask them to remember a certain decade in their lives, they remember their childhood adventures and adult duties, the aging and passing of family, the passing down of traditions. Of course, the Ireland my neighbours talk about has mostly disappeared, replaced by a modern country not very different from the USA or Britain; drive along the major roads near our house and you sit in traffic jams, pass billboards and fast-food stops, see advertisements for Hollywood blockbusters, and hear wacky morning-zoo DJs on the radio. Cities are filled with young people constantly staring at little glowing rectangles, addicted to video-games or social media, increasingly dependent on touching a screen to get the basic needs of life. Raising a teenager here means talking about “sexting,” drugs, date rapes – the same uncomfortable parent-child discussions as you need to have anywhere these days. It’s difficult enough for older Americans who grew up with television and movies, albeit an older and gentler variety. Older Irish I talk to feel like they are living in a foreign country. When I moved to rural Ireland 15 years ago, I admit, there was a lot to get used to. Ireland lies at the same latitude as southern Alaska, so the winter nights can be eighteen hours long, and the days quite dim. During the summer we have the opposite problem, and I have to cover the windows with tinfoil to get any sleep. It rains one day out of three – that’s the price you pay for the lush countryside – and even in summer it never gets very warm. Nonetheless, my family and I made a go of living here, building a house and garden and turning the land into a homestead. We grew some of our own food, kept chickens and bees, and learned as we went. I’d always loved traditional crafts, so I learned whatever I could about skills being kept alive by a few devoted aficionados. I tried my hand at blacksmithing, basketry, hedge-laying, natural building, bush-craft, leather-working, book-binding, brewing, pickling, cheese-making and wine-making, sometimes just dabbling, sometimes making it into a hobby. I had to work in Dublin to pay the bills, which meant three hours a day on the bus and back each day. That meant devoting the few remaining waking hours each day to doing chores on the land, feeding possibly checking the bees, doing some traditional crafts, giving my daughter home-schooling lessons and having a writing career on the side. Thankfully, I discovered that was much more feasible than you might imagine; a garden, animals and crafts can take up perhaps an hour or two a day, and you can learn a great deal while working around a regular life. It’s not being entirely self-sufficient or off the grid, in the manner of doomsday preppers or reality-television eccentrics, but I don’t need that kind of life, and you probably don’t either. Many people I know just want to be more self-reliant, or have fun learning skills, or to pollute less, or spend less money, or work with the land instead of against it – all things that go along with the old-fashioned skills I was learning. Most of all, I talked with elderly people, and realised what a different world they had grown up in, and what an underappreciated resource they were. I struck up conversations with neighbours passing on the road, or having tea at their house, or sitting next to them on the long bus ride to Dublin, or visiting the local old folks’ home. Occasionally I asked them if I could sit down for formal interviews, and sat down with a camera and audio recorder. I found that Irish radio had done occasional documentaries on traditional life, that school-children had collected the memories of their grandparents, that documentarians had filmed Irish villagers decades ago, and that historical societies and local experts had scrapbooks filled with the minutiae of day-to-day life. I listened to hundreds of hours of recordings and read thousands of pages of transcripts, collecting the details of their everyday lives. Again, I’m not trying to romanticise their difficult lives, or claim that they didn’t have their own problems, or that the world hasn’t improved in certain ways – of course it has. I’m not saying that we could or should do exactly what they did, or that all traditional societies were as beneficial as the examples I use. Of course Ireland in the fifties was quite different from America in the 1950s, and from many other traditional times and places, and of course I’ll be cherry-picking good qualities from many times and places and ignoring the downsides of each era. There’s no perfect past that I’m demanding we emulate. I am saying that certain peoples in history created societies that were healthy, educated, clean, happy – by their own testimony – and ran on little energy, generated little waste and needed little government. I want to look at how they did these things, and what we can learn from them.